834 WFS Online members who have logged on to the forum in the last month and over 2,000 in the last 6 months. She has challenged us to spread the word to find 100 donors. 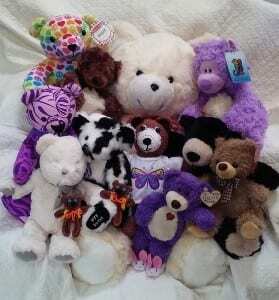 (Our most fruitful year of the Teddy Bear Challenge we had well over that many.) Will you help us get there? Our office volunteers have been hard at work this week helping me get ready for my upcoming trip to the ASAM national conference in early April. We are putting together some great Professional Sample Kits to hand out. These will contain sample literature and provider education articles to improve physician knowledge of what the New Life Program is all about. They will also contain a variety of outreach items like brochures, business cards, and bookmarks that the providers can give to their patients when they tell them about WFS. If you are planning to attend the ASAM conference, please stop by booth 529 to get your goodies! The WFS Board of Directors met this week and, among other things, approved another major software migration for WFS. NeonCRM is an all-inclusive software solution for non-profits. The things that it will be helping us with include donor and volunteer management, task automation, and event registration. My favorite part about it is that it will allow us to track service delivery at a level that we have never done before. I know I am showing my true nerd colors (I consider “nerd” a compliment, don’t worry), but I can’t wait to get the new system implemented. It will make us much more efficient so we can focus our energy where it really counts – helping women! And it will help us demonstrate the effectiveness and growth of our program, too. Well that’s all I have to report this week. Time for me to head off to a Management Team meeting!